Only current members have access to this content. 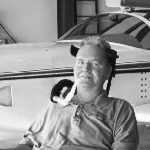 Cliff worked for Stoddard-Hamilton Aircraft Inc. (the prior company that developed and produced the Glasair design) from almost its inception and was instrumental in getting the Glasair and GlaStar product lines up and running again as a key employee of Glasair Aviation. He was hired shortly after Stoddard-Hamilton moved to Arlington, Wa. in 1982 and was a key player in the development of each of the Glasair designs.